New computer modeling suggests that high temperature TPV conversion – which captures infrared radiation from very hot surfaces – could one day rival combined-cycle turbine systems when combined with thermal storage using liquid metal at temperatures around 1,300 degrees Celsius. 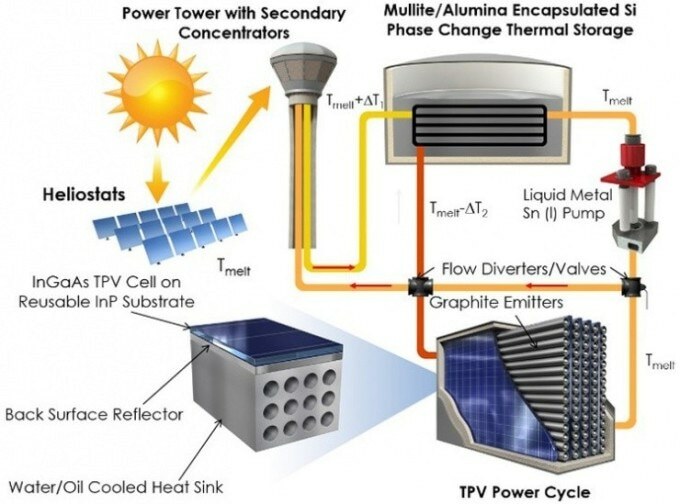 Advances in high-temperature components and improved system modeling, combined with the potential for conversion costs an order of magnitude lower than those of turbines, suggest that TPV could offer a pathway for efficiently storing and producing electrical power from solar thermal sources, a new study suggests. The underlying technologies of high temperature storage and thermophotovoltaic conversion could also be used to produce grid-scale batteries able to rapidly supplement other power sources by storing heat for quick conversion to electricity. The research, supported by ARPA-E, was reported July 4 in the journal Energy and Environmental Science by researchers at the Georgia Institute of Technology. TPV operates on the same principle as solar cells in wide use today, but converts photons at infrared wavelengths rather than those in the visible spectrum. Infrared is the predominant kind of heat and light emitted by heaters that glow red-hot. Most research reported in the energy literature suggests that the conversion rate of TPV would be less than 20 percent, not competitive with other heat engines. But Henry believes those calculations do not properly consider the conversion wavelengths or account for efficiencies possible when the full heat delivery system is considered. The heat would be supplied by a CSP system collecting the sun’s thermal energy using reflectors. The heat would be used to melt silicon, which could be stored in large insulated reservoirs until needed; the heat would then be released as the silicon solidifies. By moving the TPV cells when their power isn’t needed, the system could be rapidly switched on and off to supplement electricity from wind or direct solar PV sources, Henry said. The critical challenge to making renewable energy competitive with fossil fuels at the utility scale is making the electricity dispatchable. The cost advantages of thermal storage over electrochemical storage also make a TPV with thermal energy storage (TES) system attractive for converting and storing energy for use on the grid, said Hamid Reza Seyf, a graduate research assistant who did the system modeling. If the TPV power block could be made 60 percent efficient, it could compete with most cost effective and efficient heat engine that has ever been achieved commercially, which is accomplished through a tandem turbine based cycle. The cost of turbines is well established and unlikely to see significant decrease, hence the only way to reduce their cost is by increasing their efficiency. However, because current turbines are extremely efficient and operate near their thermodynamic limit, there is little room for efficiency enhancement. TPV power block not only has the potential for lowering the cost but also has much more room for efficiency improvement, Seyf said. The computational model shows that a TPV system coupled with concentrated solar and storage could be as much as 65 percent efficient. But attaining that would require a long-term research initiative. In their model, the group studied the effects of a silver-based back surface reflector (BSR) to bounce unused light back to the emitter. The study quantified the importance of the BSR reflectivity to the overall system performance. Henry’s research group has recently demonstrated pumps, storage containers and other components that can operate at extreme temperatures of 1,300 degrees Celsius and above. The researchers hope their new paper encourages others to pursue TPV improvements – including fabrication of TPV cells on reusable substrates – that could lead to development of real-world systems at costs competitive with fossil fuels. This project was supported by DOE ARPA-E, grant number DEAR0000339. Any opinions, findings, and conclusions or recommendations expressed in this material are those of the author(s) and do not necessarily reflect the views of the sponsor.